Planning is key for a long distance hike. Knowing your route and terrain, where you can bail, how many days of food til your next resupply, how many miles til your next water source. There are so many factors that can lead to success or distress. Rarely if ever have I said to myself “Hey, let’s wing it.” Well….today was one of those days. The nearly full moon hanging high in the early morning. The morning walking was definitely so much easier than yesterday, even with the high strong winds blowing me around. 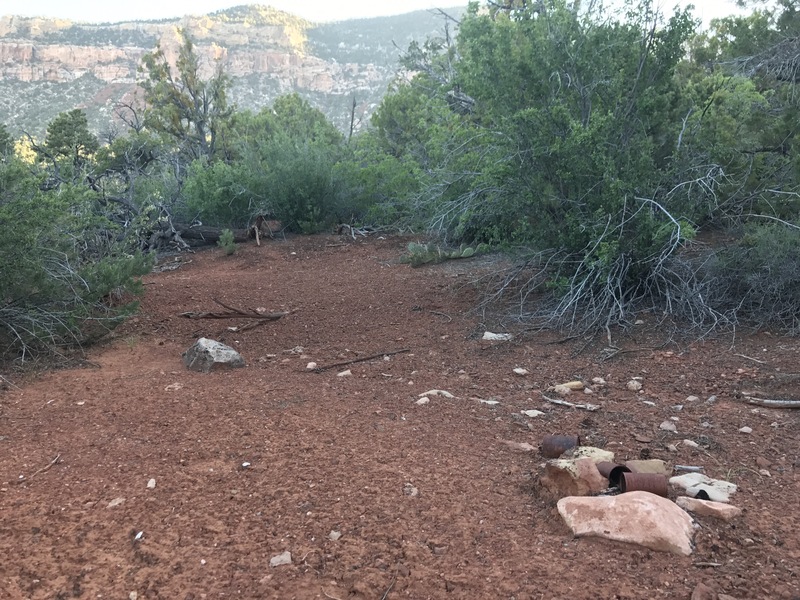 The slickrock ledges didn’t last, but they gave way to a more open ground cover that actually had some passages through. There was still some bushwhacking and manzanita tromping, but not nearly like yesterday. It was still slow going though. 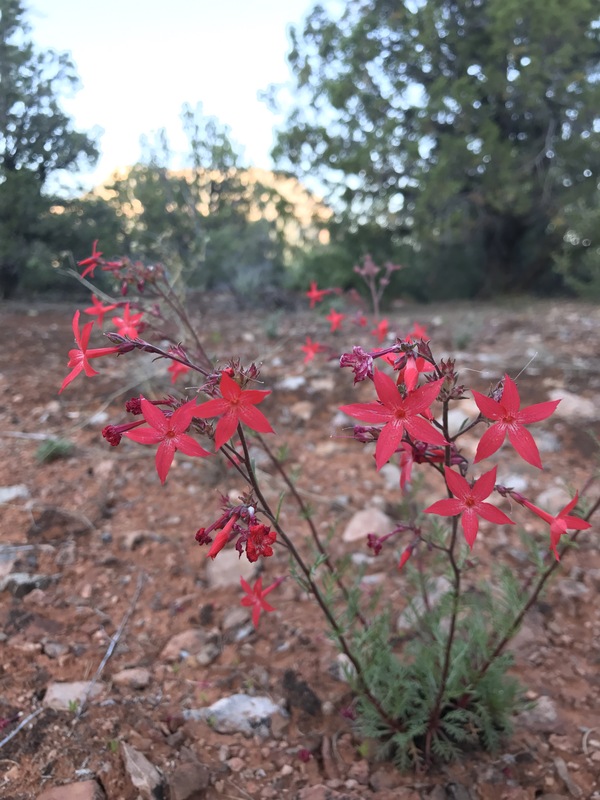 Spots of color illuminating the ground kept the mind off the slow terrain. The fascinating part was finding remnants of previous travelers in the area. 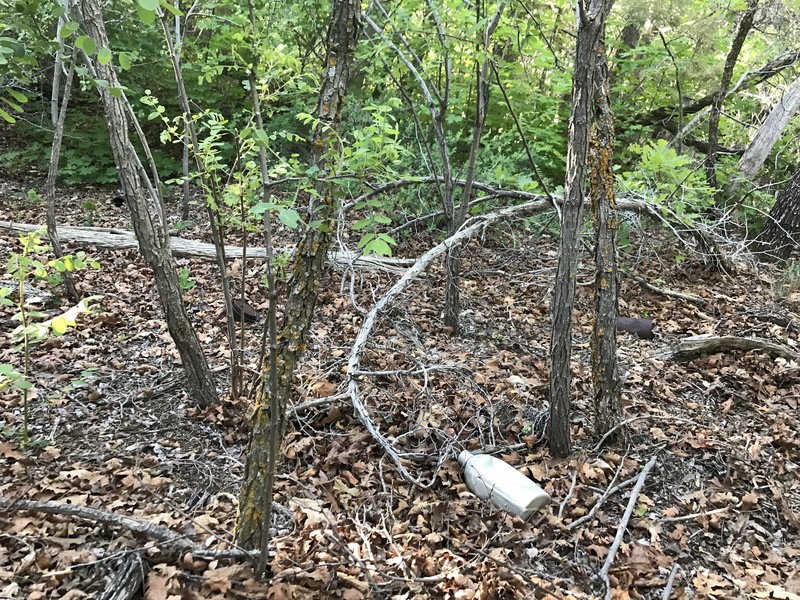 I thought this was a pretty remote part of the park, but I kept stumbling across old fire rings filled with rusty cans. Maybe from miners? Cowboys? Horse thieves? Even in the floor of Timp Canyon there were remnants of a previous time. I can only hope that the landscape then was a little bit easier to travel through. Bottles and cans strewn across the floor at the bottom of Timp Canyon. It must have been less brushy 60 years ago. A bit further along, continuing along the slow traverse I suddenly spotted something just uphill from me that faintly looked like trail-tread. Out here? I climbed up to it, and while it was fairly overgrown I was pretty certain it was indeed trail. It led me right down to the creek crossing in the side canyon I’d been making my way towards. Now there was no trail shown in this location on the map and the backcountry ranger had specifically said there was no trail in this area. Not even game trails, which I’d inquired about. What a fascinating find! I took lunch by the creek and debated my options. I figured that following trail is always easier than cross country. Why not take a chance and see where it leads? I can always turn around if it starts heading in the wrong direction or gets sketchy. Heck, some of the bushwhacking has been a little sketchy anyway. Lunch finished and the decision made I began following the trail, which quickly began ascending the cliff. Up? To the rim? If that was really where this was heading I needed to make sure I could figure out how to get back down. Out came the maps and a quick look showed that there were a series of roads up top and a trail back into the canyon a few miles away at Monument Point. The cross-country route I had developed actually used the bottom half of this trail. So that settled it. Everything was heading in the right direction and I had a plan for what to do if I ended up topping out. Sure enough the trail kept climbing up, actually becoming less overgrown and more defined as it went. As it climbed I figured this must have been an old cowboy trail as I passed numerous old barbed wire fences and even a disintegrating cattle trough high up on a narrow cliff. Old cattle tank along the cliff. It’s so hard to imagine cattle grazing in this area. 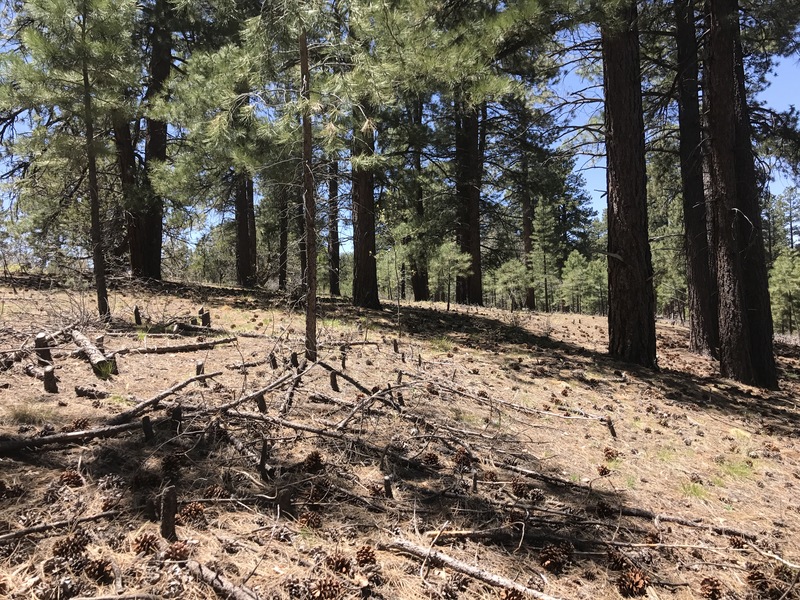 Within the hour I was up top back in the Kaibab Forest surrounded by tall shady Ponderosa, though oddly, someone had been through and cut back all of the smaller ones. An old broken down corral stood not too far away. Another trip to the Ponderosa forests on the Rim. The forest service roads over here were super well maintained compared to the NPS ones I was on earlier and a quick walk brought me to the Monument Point Overlook and Bill Hall Trail, complete with 15 cars in the parking lot. I was shocked to see so much usage up here! 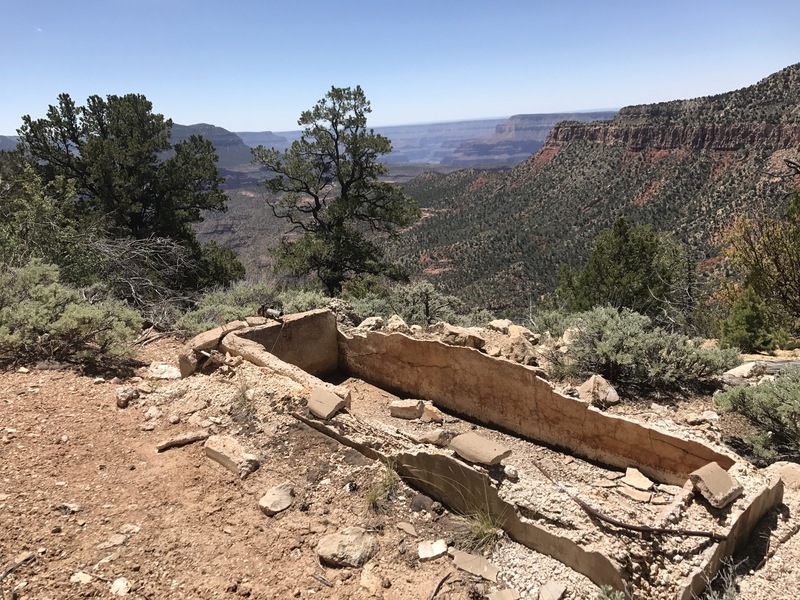 The Bill Hall Trail (named after an NPS ranger killed in the line of duty in the 1970s) takes in amazing views along its 7 mile route down to Surprise Valley. 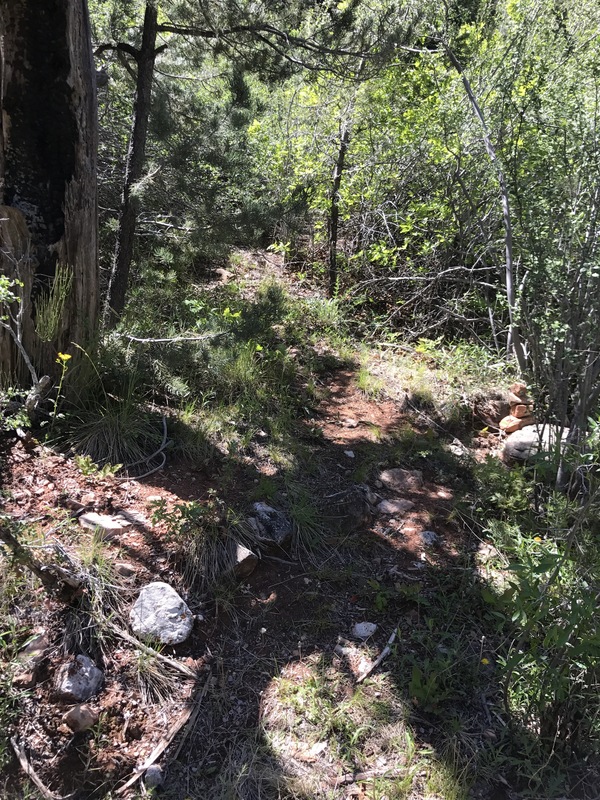 Having been spoiled by the Bright Angel and Kaibab trails, I’d momentarily forgotten how rough the other actual trails have been in this park- the unmarked one was even in better shape (except for the early brush). Steep switchbacks and lose rock were the norm headed down as I focused on maintaining my footing. But the look down at my feet gave me lots of opportunity to see the bursts of orange and white flowers covering the ground. Globemallow! I’d never seen it before this trip and have quickly come to love it. Once I reached the Esplanade I was happy to find that it was all slickrock and open ground cover. It makes me wonder if I’d stuck out my original alternate route if it would have gotten better and travel gone more smoothly. Open and easy walking on this side of the Esplanade. Another set of tight switchbacks brought me slowly down to the floor of Surprise Valley and hooked me back in with the guidebook route. I couldn’t believe it! I was back on route and actually a day ahead of schedule! Switchbacks down into Surprise Valley. It was a little after 6:00 and I was ready to camp, but I had one problem. I was nearly out of water. It had been pretty prevalent in the early part of this crosscountry section across the Esplanade, and while I grabbed some right before heading for the Rim, it wasn’t quite enough to tide me over until tomorrow morning. Fortunately, Deer Creek wasn’t too far, only another 2 miles. 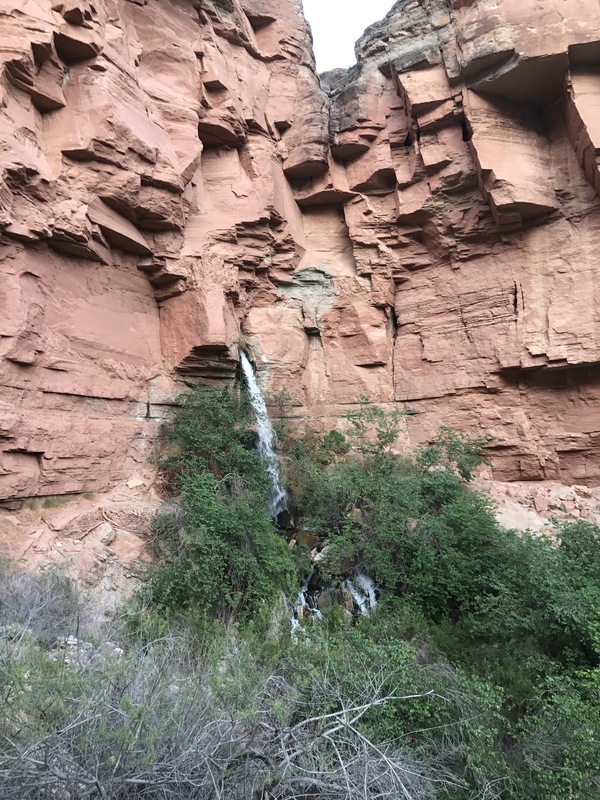 So with sore feet and achey knees I headed down trail, pace gradually slowing all the while, realizing I still had another 1,000 feet to drop before getting to the creek and water, slowly rationing what I had left.The sun dropping behind the cliffs and shadows slowly taking over. A thunderous echoing to the left revealed Deer Springs- which is really a huge waterfall pouring directly out of a cave in the cliff face. “The Throne Room” where Deer Springs pours out of the cliff. Another half mile and I arrived at the campground. After 7:00, but thankful to drop my pack and get some water after a long eventful day. 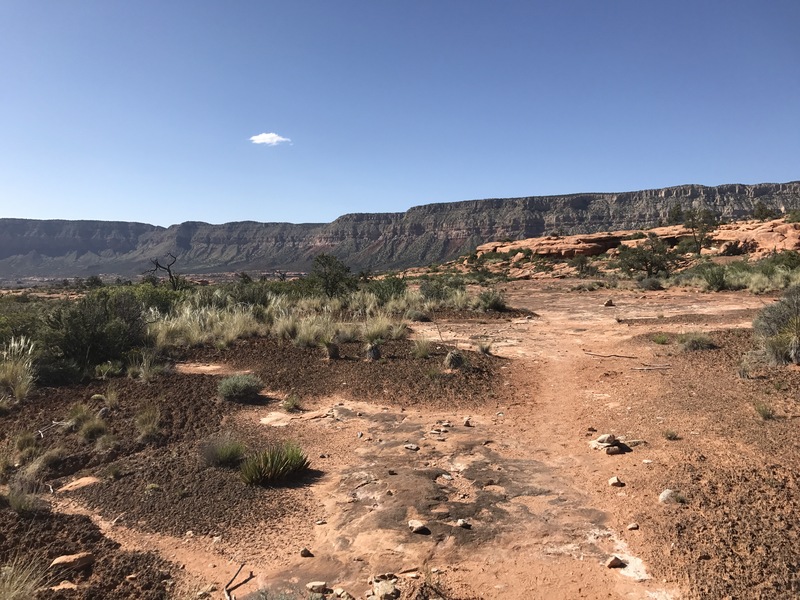 There were three other folks at the camp- Dustin, Gary, and Dale who were out for a five day loop of the Tapeats and Deer Creek via the Bill Hall trail. As I unpacked my bag we chatted for a bit. I asked about how the Tapeats was looking upstream of Thunder Falls and they said, “Yeah, you maybe could have made it….with a lifejacket and an innertube.” I felt totally justified in detouring now. Absolutely no regrets. I felt a little sheepish, but I was super excited to hear that my boat friends were only about a half mile down river. I would definitely get a chance to see them in the morning. Dustin offered to have me use his charger to reenergize my InReach and phone and we chatted and shared photos well past dark about other trips, frogs, snakes, and lizards. It’s nice to be camped with other friendly folks in the backcountry. I guess sometimes winging it does turn out alright after all (though I don’t want to make a habit of it). Camping in an established site. The joys of being in a National Park.